I already have a no bake snickerdoodle recipe and a gluten free snickerdoodle recipe on the blog, but I have been wanting to make a flourless snickerdoodle recipe for a while now. You guys! These are so good! The best part? All you need is 4 simple ingredients and 15 minutes! These are so good, you would never guess there was NO flour or NO oil in them! They are buttery delicious. These are not only flourless, but they are vegan, gluten free and paleo approved. This might quickly become my favorite cookie! This recipe makes a very small batch, so you don’t have to feel stuck with a large bunch of cookies in the house. 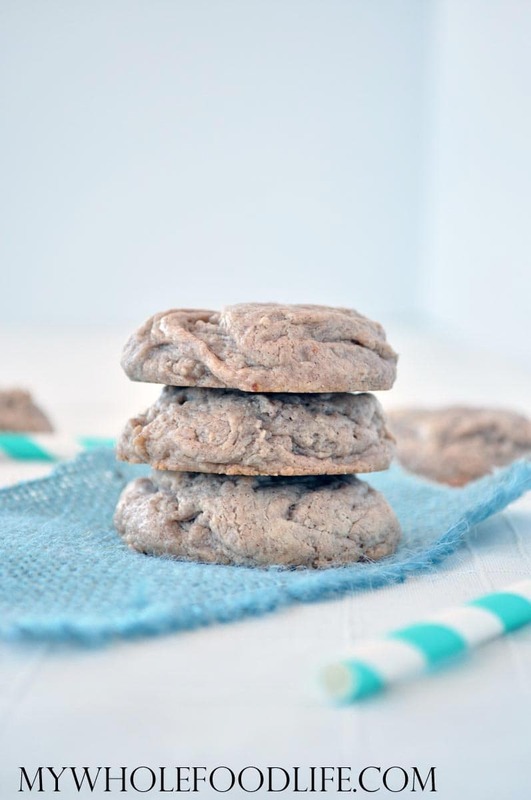 All you need is 15 minutes and 4 ingredients to make these yummy cookies! In a food processor , combine all the ingredients. Drop cookies on a lined baking sheet . I used a cookie scoop to form mine. Let the cookies cool completely before removing from the baking sheet. My kids have tree nut and coconut allergies... What can you use instead of cashew butter? Sunflower butter may work, but the texture and taste may be slightly different. Yum! These look totally amazing. Absolutely love that they are egg-free as my dad is allergic. These look delicious. Do you think if I used a Vitamix I could use raw or roasted cashews (unsalted) instead of cashew butter? If so what would be the quantitiy? Thanks for another great recipe! Glad you liked those! Chips would be a great addition to this recipe! Hi I can't find the recipe for flourless caramel cookies. Could you point me in the right direction please? Wow these look so tasty and simple! I'm a huge fan of snickerdoodle cookies (I even made some snickerdoodle cashew butter..yum) but my cookies have wayyy more ingredients! Would almond butter work in place of the cashew butter? Yes it will, but the texture is ideal with the cashew butter. These sound very tasty. I'll prepare them for my kids, I think they will like it. Just made these... YUM!! This recipe's a keeper!! Thank you! I tend to not like recipes that call for maple syrup so I am wondering if honey could be substituted with good results? Thanks, Melissa. Couldn't you just make everything in the Vita-Mix after you've made your cashew butter? This would save on dishes! Also, I have found that you need a minimum of 3 1/2 - 4 c of cashews in the Vita-Mix to be able to tamp it down better as if it's too low, the tamper has a hard time reaching it after blending. However, if you didn't and there were a few lumpy cashews in it, this might be okay too! I plan on adding some chocolate chips to mine as well! I actually make the butter in my food processor, but you can make everything in the Vitamix too. Awesome Susan! So glad you liked them! Like the Recipes.....Good work! I will try some of the recipes and see how they come out. See more recipes soon, thanks.